The Main Issues Report (MIR) is the first stage in preparing the new Local Development Plan (LDP) for 2016 and shown below are the proposals for Kemnay. Comments on LDP2016 proposals should be submitted before 1st February 2014and details of where to submit your comments are shown below. New development bid for 56 houses, north of Cairn View (south of POO). Presently Agricultural use this site was subject of a development bid in the last LDP when it had the designation of site H1. 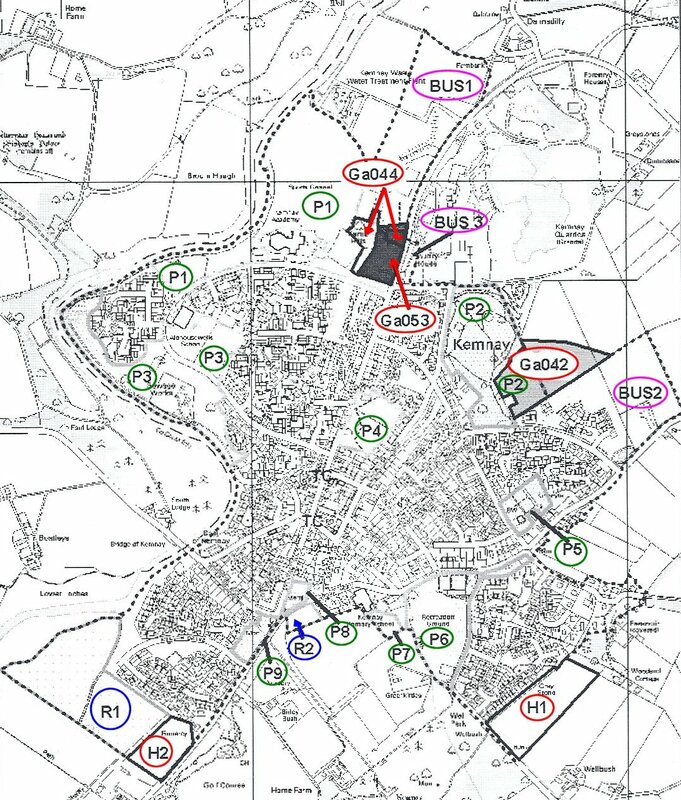 It was rejected for housing after examination prior to last LDP for reasons mainly relating to amenity relating to views from POO and also when entering the village from the east. Planning Officers consider that circumstances have not changed and do not support the present development bid. New development bid for 25 houses on two sites at Bremner Way. This site is substantially on and includes site Ga053 (below). It presently has Protected status for Recreational use possibly future swimming pool. Planning Officers do not prefer development of housing on this site because it includes an area of woodland. New development bid for 30 houses at Bremner Way / Aquithie Road. This site presently has Protected status for Recreational use possibly future swimming pool. Planning Officers indicate that there have been no bids for recreational use and would therefore be inclined to support a well designed housing development on this site.